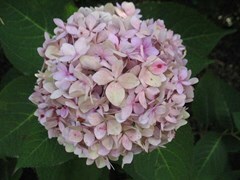 Hydrangea macrophylla is best grown in rich, medium moisture, well-drained soils in part shade. Tolerates full sun only if grown in consistently moist soils. Soil pH affects the flower color of most cultivars except white (blue in highly acidic soils and lilac to pink in slightly acidic to alkaline soils). Add aluminum sulfate to the soil to make the flowers bluer or add lime to the soil to make the flowers pinker. Begin soil treatments well in advance of flowering, as in late autumn or early spring. Plants generally need little pruning. If needed, prune immediately after flowering by cutting back flowering stems to a pair of healthy buds. Prune out weak or winter-damaged stems in late winter/early spring. Best to mulch plants year-round with 3" of shredded bark, peat or compost. Winter hardy to USDA Zone 6. For added protection, however, plants grown in USDA Zone 5 should be sited in sheltered locations and given additional winter protection, as needed, for the purposes of minimizing the risk of loss of significant numbers of flower buds or possible die-back to the ground in an extremely harsh winter. A burlap wrap of stems or circle of chicken wire filled with leaves or straw to 8-12" are time-consuming and visually unattractive landscape options, but can be effective. Regardless of protective measures taken, most bigleaf hydrangeas simply will not bloom (or will bloom poorly) in some years because of a variety of winter occurrences beyond the control of the gardener (e.g. low temperatures, sudden wide temperature fluctuations, icy conditions, late frosts). Some newer cultivars have been selected that flower on both old and new wood. Their pruning and flowering can differ from that of the species. 'David Ramsay' blooms on both old and new growth and reportedly has better winter hardiness than many of the other H. macrophylla cultivars in commerce today. Even if old growth buds are damaged in winter, plants should still flower in summer on new growth. Hydrangea macrophylla, commonly called big leaf hydrangea, is a deciduous shrub with a rounded habit that, in the St. Louis area, typically grows 3-6’ tall and as wide unless damaged by harsh winters or pruned smaller. It generally features serrate, obovate to elliptic, dark green leaves (4-8” long) and large clusters of long-blooming summer flowers in either lacecap form (flattened flower clusters of small fertile florets with scattered showy sterile florets often forming a marginal ring) or mophead form (globose flower clusters of mostly showy sterile florets). Genus name comes from hydor meaning water and aggeion meaning vessel in reference to the cup-like capsular fruit. Specific epithet comes from the Greek words makros meaning large and phyllon meaning leaf in reference to plant leaves. 'David Ramsey' is an upright mophead cultivar that grows on strong stems to 4-5' tall and to 5-6' wide. It typically blooms on old wood in late spring with repeat bloom on new wood from summer often into fall if spent flowers are regularly deadheaded. Each inflorescence (to 8-10") is a large globose cyme (mophead) that is covered with showy sterile florets and a few fertile florets. Each sterile floret ranges in color from pink (acid soils) to blue (alkaline soils). Leaves (to 4-8" long) are dark green with serrate edges. It is interesting to note that H. macrophylla 'David Ramsey' (unpatented) was discovered in Stone Mountain Georgia whereas H. macrophylla 'Bailmer' ENDLESS SUMMER (U. S. Patent issued November 9, 2004) was discovered in a cultivated garden in St. Paul, Minnesota. Subsequent to the release of both plants into commerce, DNA testing at the University of Arkansas revealed that the two cultivars may be identical. No serious insect or disease problems. Some susceptibility to bud blight, bacterial wilt, leaf spot and mildew. Aphids are occasional visitors. Group or mass in the shrub border. Also a good specimen or accent for foundations and other locations near homes or patios. Hedge. Containers.